Carina Nebula in infrared light captured by the Hubble's Wide Field Camera 3. Infrared astronomy is the branch of astronomy and astrophysics that studies astronomical objects visible in infrared (IR) radiation. The wavelength of infrared light ranges from 0.75 to 300 micrometers. Infrared falls in between visible radiation, which ranges from 380 to 750 nanometers, and submillimeter waves. Infrared astronomy began in the 1830s, a few decades after the discovery of infrared light by William Herschel in 1800. Early progress was limited, and it was not until the early 20th century that conclusive detections of astronomical objects other than the Sun and Moon were made in infrared light. After a number of discoveries were made in the 1950s and 1960s in radio astronomy, astronomers realized the information available outside the visible wavelength range, and modern infrared astronomy was established. Infrared and optical astronomy are often practiced using the same telescopes, as the same mirrors or lenses are usually effective over a wavelength range that includes both visible and infrared light. Both fields also use solid state detectors, though the specific type of solid state detectors used are different. Infrared light is absorbed at many wavelengths by water vapor in the Earth's atmosphere, so most infrared telescopes are at high elevations in dry places, above as much of the atmosphere as possible. There are also infrared observatories in space, including the Spitzer Space Telescope and the Herschel Space Observatory. The discovery of infrared radiation is attributed to William Herschel, who performed an experiment in 1800 where he placed a thermometer in sunlight of different colors after it passed through a prism. He noticed that the temperature increase induced by sunlight was highest outside the visible spectrum, just beyond the red color. That the temperature increase was highest at infrared wavelengths was due to the spectral response of the prism rather than properties of the Sun, but the fact that there was any temperature increase at all prompted Herschel to deduce that there was invisible radiation from the Sun. He dubbed this radiation "calorific rays", and went on to show that it could be reflected, transmitted, and absorbed just like visible light. High on the Chajnantor Plateau, the Atacama Large Millimeter Array provides an extraordinary place for infrared astronomy. Efforts were made starting in the 1830s and continuing through the 19th century to detect infrared radiation from other astronomical sources. Radiation from the Moon was first detected in 1856 by Charles Piazzi Smyth, the Astronomer Royal for Scotland, during an expedition to Tenerife to test his ideas about mountain top astronomy. Ernest Fox Nichols used a modified Crookes radiometer in an attempt to detect infrared radiation from Arcturus and Vega, but Nichols deemed the results inconclusive. Even so, the ratio of flux he reported for the two stars is consistent with the modern value, so George Rieke gives Nichols credit for the first detection of a star other than our own in the infrared. The field of infrared astronomy continued to develop slowly in the early 20th century, as Seth Barnes Nicholson and Edison Pettit developed thermopile detectors capable of accurate infrared photometry and sensitive to a few hundreds of stars. The field was mostly neglected by traditional astronomers though until the 1960s, with most scientists who practiced infrared astronomy having actually been trained physicists. The success of radio astronomy during the 1950s and 1960s, combined with the improvement of infrared detector technology, prompted more astronomers to take notice, and infrared astronomy became well established as a subfield of astronomy. Infrared space telescopes entered service. In 1983, IRAS made an all-sky survey. In 1995, the European Space Agency created the Infrared Space Observatory. In 1998, this satellite ran out of liquid helium. However, before that, it discovered protostars and water in our universe (even on Saturn and Uranus). On 25 August 2003, NASA launched the Spitzer Space Telescope, previously known as the Space Infrared Telescope Facility. In 2009, the telescope ran out of liquid helium and lost the ability to see far infrared. It had discovered stars, the Double Helix Nebula, and light from extrasolar planets. It continued working in 3.6 and 4.5 micrometer bands. Since then, other infrared telescopes helped find new stars that are forming, nebulae, and stellar nurseries. Infrared telescopes have opened up a whole new part of the galaxy for us. They are also useful for observing extremely distant things, like quasars. Quasars move away from Earth. The resulting large redshift make them difficult targets with an optical telescope. Infrared telescopes give much more information about them. During May 2008, a group of international infrared astronomers proved that intergalactic dust greatly dims the light of distant galaxies. In actuality, galaxies are almost twice as bright as they look. The dust absorbs much of the visible light and re-emits it as infrared light. Hubble infrared view of the Tarantula Nebula. Infrared radiation with wavelengths just longer than visible light, known as near-infrared, behaves in a very similar way to visible light, and can be detected using similar solid state devices (because of this, many quasars, stars, and galaxies were discovered). For this reason, the near infrared region of the spectrum is commonly incorporated as part of the "optical" spectrum, along with the near ultraviolet. Many optical telescopes, such as those at Keck Observatory, operate effectively in the near infrared as well as at visible wavelengths. The far-infrared extends to submillimeter wavelengths, which are observed by telescopes such as the James Clerk Maxwell Telescope at Mauna Kea Observatory. Artist impression of galaxy W2246-0526, a single galaxy glowing in infrared light as intensely as 350 trillion Suns. Like all other forms of electromagnetic radiation, infrared is utilized by astronomers to study the universe. 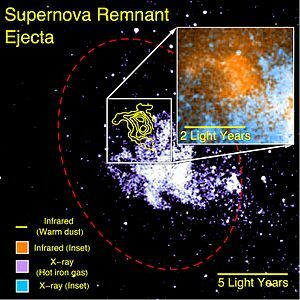 Indeed, infrared measurements taken by the 2MASS and WISE astronomical surveys have been particularly effective at unveiling previously undiscovered star clusters. Examples of such embedded star clusters are FSR 1424, FSR 1432, Camargo 394, Camargo 399, Majaess 30, and Majaess 99. Infrared telescopes, which includes most major optical telescopes as well as a few dedicated infrared telescopes, need to be chilled with liquid nitrogen and shielded from warm objects. The reason for this is that objects with temperatures of a few hundred kelvins emit most of their thermal energy at infrared wavelengths. If infrared detectors were not kept cooled, the radiation from the detector itself would contribute noise that would dwarf the radiation from any celestial source. This is particularly important in the mid-infrared and far-infrared regions of the spectrum. To achieve higher angular resolution, some infrared telescopes are combined to form astronomical interferometers. The effective resolution of an interferometer is set by the distance between the telescopes, rather than the size of the individual telescopes. When used together with adaptive optics, infrared interferometers, such as two 10 meter telescopes at Keck Observatory or the four 8.2 meter telescopes that make up the Very Large Telescope Interferometer, can achieve high angular resolution. Atmospheric windows in the infrared. As is the case for visible light telescopes, space is the ideal place for infrared telescopes. In space, images from infrared telescopes can achieve higher resolution, as they do not suffer from blurring caused by the Earth's atmosphere, and are also free from absorption caused by the Earth's atmosphere. Current infrared telescopes in space include the Herschel Space Observatory, the Spitzer Space Telescope, and the Wide-field Infrared Survey Explorer. Since putting telescopes in orbit is expensive, there are also airborne observatories, such as the Stratospheric Observatory for Infrared Astronomy and the Kuiper Airborne Observatory. These observatories place telescopes above most, but not all, of the atmosphere, which means there is absorption of infrared light from space by water vapor in the atmosphere. 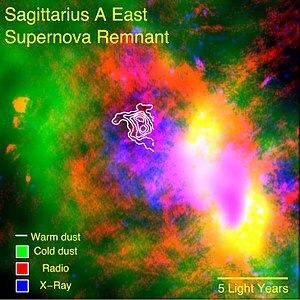 SOFIA science — supernova remnant ejecta producing planet-forming material. One of the most common infrared detector arrays used at research telescopes is HgCdTe arrays. These operate well between 0.6 and 5 micrometre wavelengths. For longer wavelength observations or higher sensitivity other detectors may be used, including other narrow gap semiconductor detectors, low temperature bolometer arrays or photon-counting Superconducting Tunnel Junction arrays. Special requirements for infrared astronomy include: very low dark currents to allow long integration times, associated low noise readout circuits and sometimes very high pixel counts. ^ "Herschel Discovers Infrared Light". Cool Cosmos. Archived from the original on 25 February 2012. Retrieved 9 April 2010. ^ "First Results from the ESO Ultra HD Expedition". ESO Announcement. Retrieved 10 May 2014. ^ a b Rieke, George H. (2009). "History of infrared telescopes and astronomy". Experimental Astronomy. 25 (1–3): 125–141. Bibcode:2009ExA....25..125R. doi:10.1007/s10686-009-9148-7. ^ Glass, Ian S. (1999). Handbook of Infrared Astronomy. Cambridge, England: Cambridge University Press. ISBN 0-521-63311-7. ^ "Science in Context - Document". link.galegroup.com. Retrieved 25 September 2017. ^ "Unravelling the web of a cosmic creeply-crawly". ESA/Hubble Press Release. Retrieved 18 January 2014. ^ "Artist's impression of the galaxy W2246-0526". Retrieved 18 January 2016. ^ "IR Atmospheric Windwows". Cool Cosmos. Retrieved 9 April 2009. ^ a b c Werner, Debra (5 October 2010). "Last-minute Reprieve Extends WISE Mission". Space News. Retrieved 14 January 2014.